We are nearing the end of our holiday baking, and I'm way backed up on making the recipe cards and posting them for you. It's hanging over my head like a dark cloud. Because I dislike dark clouds, here's one more recipe towards that goal. I think I have six more to post yet. Forget my holiday stress though, we all have it, don't we? Then we have post-holiday stress to look forward to, then New Year's Resolutions and Weight Watchers. But for now, we party, so here we go. I'm excited to share this recipe for White Chocolate Egg Nog Fudge with you. This is another of the recipes from Peanut Head's family, and one that we've been making for years. It's very tasty and I haven't met anyone yet that doesn't love it. I'm not a fan of Egg Nog myself, but I love this fudge. In fact, I don't drink Egg Nog at all. Blech. 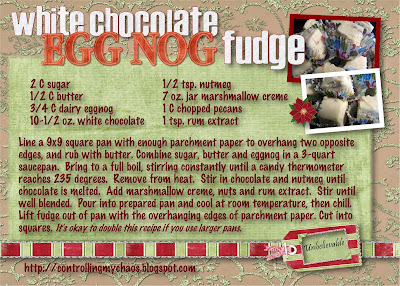 Here are the ingredients: marshmallow creme, sugar, butter, white chocolate, dairy Egg Nog, pecans, Rum Extract and Nutmeg. Start by melting the butter over low heat. Add sugar, then Egg Nog and start heating it up. You want the temperature to reach 235 degrees fahrenheit, so you'll need your candy thermometer clipped to the pan and in the mixture at this point. Once you reach the magic number, take the mixture off the heat and stir in the marshmallow creme. You have to be a little rough, it's like smacking the Stay Puft Marshmallow Man around. That's right, he's in the Dog House. Bad Marshmallow Man. Once Mr. Stay Puft is incorporated, you can add your nuts. Then pour it all onto your parchment paper lined pan and let cool at room temperature, then in the fridge for a couple hours. Since I live in Ida-below-freezing-in-the-winter-ho, we use our garage as a freezer for our holiday baking spree. It's very convenient. I just left the fudge in the garage for a bit and it was ready to cut up in a jiffy. By the way, I doubled this recipe so that's why it's bigger than 9x9 like the recipe states. We make four batches of this stuff during our holiday baking spree, so I double recipes whenever I can. The parchment paper makes it super easy to get the fudge out of the pan, so cutting it is a breeze. No lie. See. Just grab your butcher knife and go to town. I love my butcher knife. I get jealous when other people use it. You think I'm kidding, I know. We like to put the pieces in individual candy cups so they don't stick to everything else once we put the goodies together to distribute. Plus it makes them pretty. Do not, I repeat, do not stay in the house alone with this fudge. Once you start, you cannot stop. Go make some and enjoy the yum! You make the most FABULOUS recipes. I don't like eggnog either but that fudge looks to die for good!!! white chocolate eggnog fudge, all those words sound so good together!! you had me convinced until I saw the evil candy thermometer!! It sounds interesting, for sure. I love egg nog, fudge, & chocolate, but white chocolate is a different story. But, I will definitely save this recipe, because I know that I know someone that will eat the hell out of this! The recipe card is so cute! I feel the exact same way about Egg Nog but I trust you on the fudge so I'm going to try it! Thanks for the great recipe ideas! Oooooh! That looks amazing! Send me some ;-) I don't think I could ever make it like your pictures look! I would love to try this recipe! Where in the recipe do you add the white chocolate? Is it before or after the marshmellow creme?